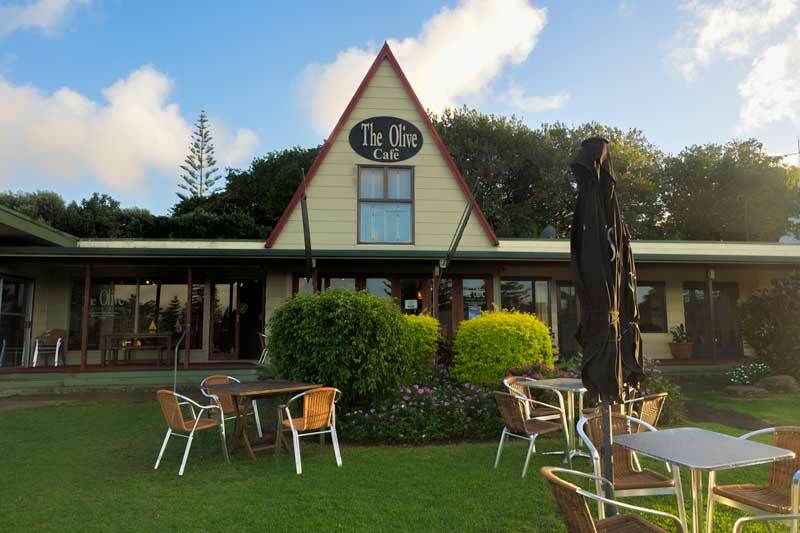 Looking for a guide to the best Norfolk Island restaurants, cafes and artisan producers? Try our top 7 picks and you won’t be disappointed! An island by definition can be expected to have some limitations with fresh food availability and choice. I’d expected Norfolk Island to face more of a challenge than most given their strong bio-security controls that tightly limit any fresh produce coming onto the island. As someone who ranks food experiences and local cuisine as a huge part of our travel experience I was pleasantly surprised to find that not only are the restaurants on Norfolk Island taking up this challenge and coming up trumps, but they’re turning it to their advantage taking the slow food movement, organic produce and the eat local trend to heart and putting up some amazing dishes and produce. On a recent visit we had the chance to sample a variety of Norfolk Island restaurants and talk to those leading the local food revolution. 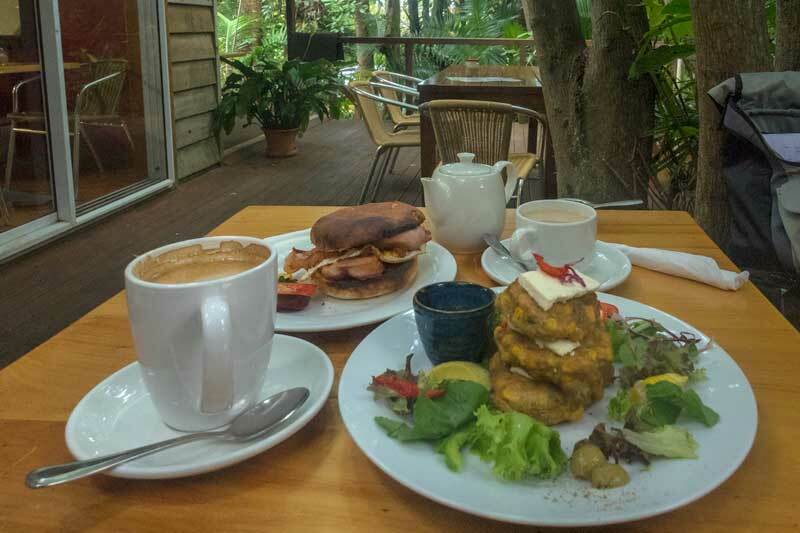 If you’re wondering where to eat on Norfolk Island these were our top picks. As we chatted over the bar during our wine tasting at the Two Chimneys Winery Noelene tells us how working solely with the seasonal produce, grown and prepared herself, has made her both creative and resourceful. Later as we shared one of her famed lunch time platters I’d have to agree. It’s not only delicious but a work of art and with availability changing every few weeks no two platters are going to be quite the same. She mixes it up with each platter never using the same ingredient fresh as she does in the preserves. We had fresh banana and persimmon with pastes of cherry guava, beetroot and avocado. There were 4 different cheeses plus Noelenes own recipe nut encrusted cheese balls. 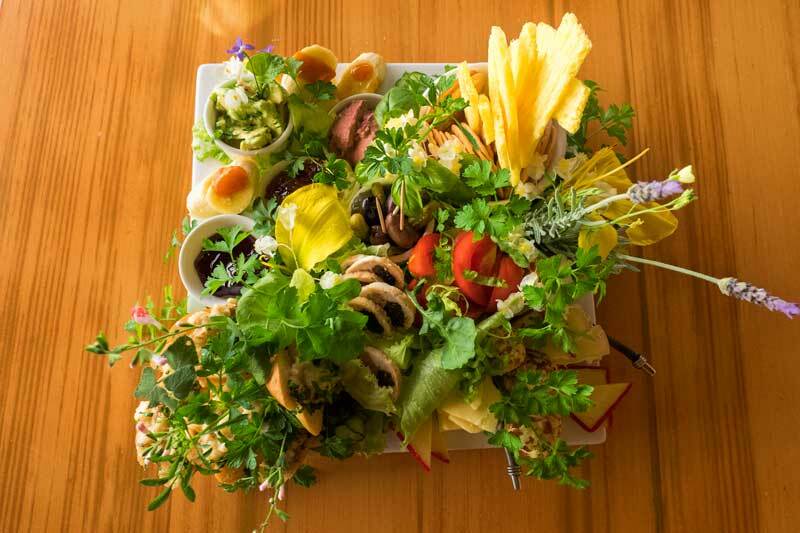 Also featured are rolled chicken stuffed with dried fruit, crostini with shiitake cream, crackers, pickled cucumber, olives, baby gherkins and garnishes with a variety of salad greens and flowers grown in their garden. I had no idea such a variety of flowers were edible, day lilies, viola and my favourite, the little begonia flowers with their delicate hint of citrus, were all in the mix together with others I didn’t recognize. While it’s a platter for 2 it’s a generous serve and you could graze all afternoon on it along side a glass or two of wine. Rod and Noelene have run the winery for over 10 years now. It’s built on Buffet family land at Steels Point on the north east coast. The winery provides a beautiful place to relax at the bar or outside on the veranda overlooking the Chambourcin vines. It’s built entirely from Norfolk Pine with Italian tile floors adding to the warm and welcoming atmosphere. If you join them for a wine tasting you’ll learn more about the vineyard and pick up tasting notes and serving suggestions for their wide selection produced in conjunction with Cassegrain Wines in Port Macquarie. A helpful tip we didn’t learn until later is that if you are flying back to Australia you’re able to carry liquids through border control here so you’re able to buy your wine from the cellar door and carry it through as hand luggage. The Hilli Goat farm is just up from Anson Bay in the north west of the island. Emily greats us with a smile and a huge amount of energy for a young Mum with her own fledgling business. They grow up with determination here on the island. When Emily decided to farm goats and produce organic goat milk products on the island she must have known she was talking on a challenge, until that point there were no goats on Norfolk and she had no idea how to make cheese. These minor obstacles didn’t deter her and she plunged forward obtaining a Churchill Fellowship to study cheese making with two respected organic cheese makers in Victoria, Australia then followed up with the administrative task of not only sourcing her goats and physically getting them onto Norfolk but getting through the bureaucratic process to obtain permission to introduce a new animal to the island. It’s clear that Emily is passionate about the venture but the extended family are all involved in the process, her Dad cames down to help out at milking time today and husband Zach isn’t far away. During the tour you have the opportunity to meet the goat herd, observe the milking process, see the cheese making room and learn how it’s prepared. Currently the milk is all used to produce chevre, a soft goats cheese and a small skincare range but there are plans to add additional cheese varieties to the mix as the herd grows. With two young female goats growing up in the herd currently and another two females pregnant the venture is already expanding. Then it’s time for perhaps the best part, enjoying afternoon tea of fresh cheese products on the deck overlooking the fabulous coastal views. On a warm afternoon the homemade ginger, lemon and herb infusion we’re offered is refreshing and readies the palette for the flavors of the spread Emily has prepared for us. 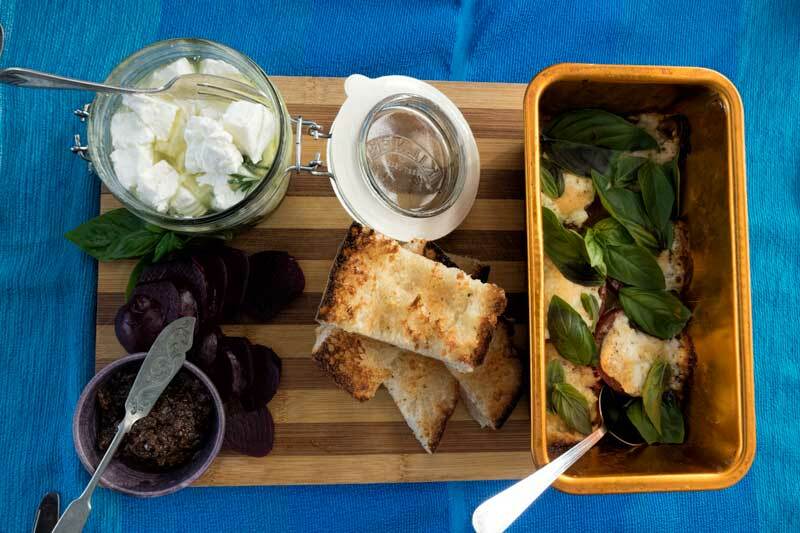 There is freshly toasted bruschetta as a canvas for flavourful garden tomatoes topped with goat cheese and Parmesan, marinated goat cheese with herbs, a delicious feijoa chutney and roasted beetroot. Although in completely different parts of the island I’d initially thought the Hilli Restaurant and Cafe was somehow connected to the Hilli goat farm. It turns out Hilli is a term in the local Norfolk language meaning laid back or lazy. There’s certainly nothing lazy about the restaurant or the creativity of the menu so I’m guessing it comes from the diners deciding “I’m having a hilli (lazy) day, lets go out to eat”. Whatever your rational for going, this restaurant is great and we’d highly recommend it. I took the chance to try the local fish known as Trumpeter which is very similar to Red Emperor. It was served on a galette of sweet potato and seasonal vegetables with a champagne and lemon beurre blanc sauce while Drew went with the beef tenderloin on horseradish infused mash, local vegetables with bearnaise sauce and a roasted garlic jus. Both were delicious. Although by this point we in no way needed dessert we’d been told no matter what you HAVE to have dessert here. I’m very pleased I heeded the warning as the Baileys creme brulee along side a malted honeycomb ice-cream was an excellent way to end the evening as was the Chocolate mud cake serve with an espresso anglaise, berry coulis and a homemade Snickers ice-cream. 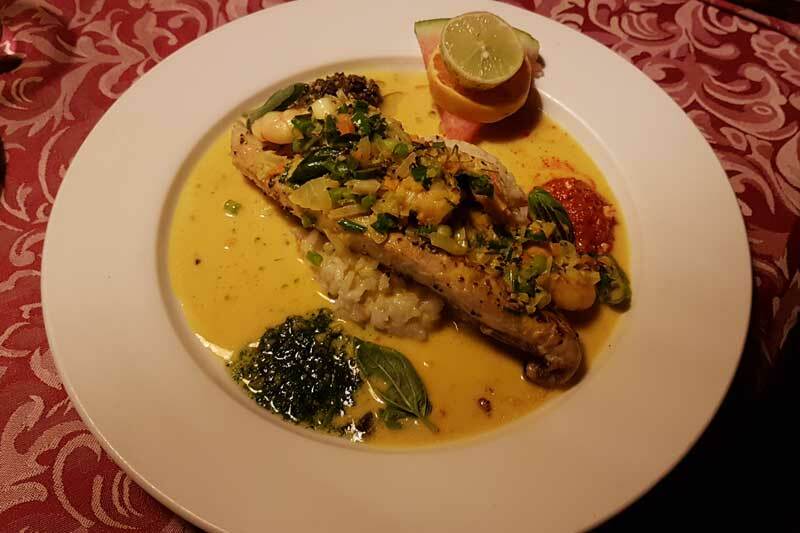 One of the top fine dining restaurants on the island is Dino’s. It’s located in the island home of Dean (Dino) and his wife Helen. The house was built around the 1800’s from Norfolk Island pine and convict cut sandstone, the ambiance that comes with that and the decorative flair are a big part of the experience here. Dino’s is popular with locals but I’d say at least one meal here should be on your list as a visitor too, it’s not open every day so make sure you book before heading out there. The menu flexes and evolves with availability, if they run out of one things, something new will be added. I ordered the kingfish and prawns served with a laksa inspired sauce on a risotto base followed with a homemade fig and ginger ice-cream, it was excellent. The lime delicious pudding, a late substitution when the lemons ran out, was equally good. The quality of produce and balance of flavours mark this as a top dining experience and reflect Deans skill as a chef. The Olive quickly became our ‘local’ and we stopped in here regularly during our stay. 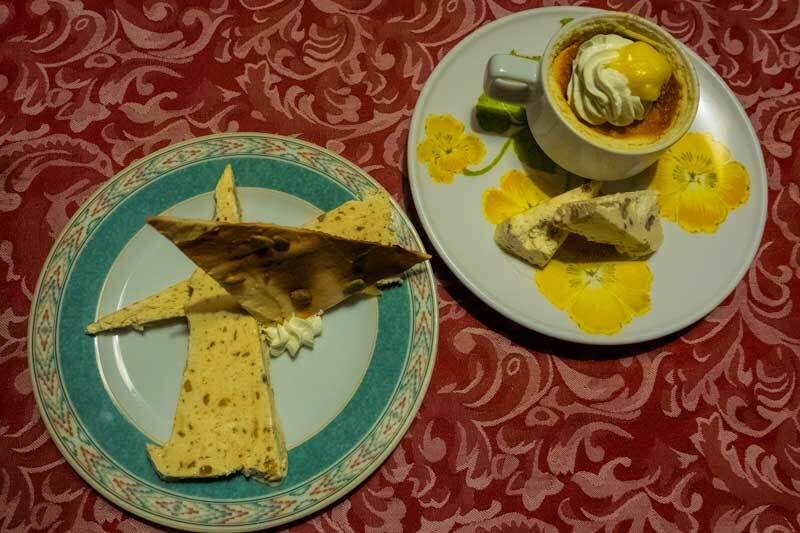 They do excellent breakfasts, lunch and coffee with cake selections during the day. There’s a large indoor seating section broken up into rooms plus tables on the deck and grass outside. It goes become a bit crowded at peak times being a favorite with both the locals and tourists but persevere and find a table, it’s worth it. My favourite here was the coconut loaf served with whipped coconut cream and a citrus curd for breakfast, it’s divine but for the more traditional breakfast lover Drew will vouch for the cooked breakfasts too. They serve a good Campos coffee here along with my preference of a chai latte or huge T2 tea selection. The Golden Orb is tucked away down a tree lined path in the middle of town. We picked a table out on the deck under the shade of a giant tree then noticed a sign on the table warning diners to beware of falling avocados, looking up there were some large avocados ripening but sadly none decided to fall while we enjoyed breakfast. If you do make it out here we have to recommend ordering something with the bacon, it’s produced here on island and smoked with Norfolk Pine giving a slightly stronger smoky flavor than usual but it’s the local processing that makes this bacon seriously good, without the addition of excessive fluid in the curing process it cooks up caramelizing the fat to absolute perfection. As we didn’t fly in until Saturday afternoon we missed the Saturday Farmers market which is held down by the Information Centre in town but I’d add this to the must do list for any foodies visiting. All produce is seasonal and from the island of course and I understand both the amazing bacon and Hilli Goat products can be found here. 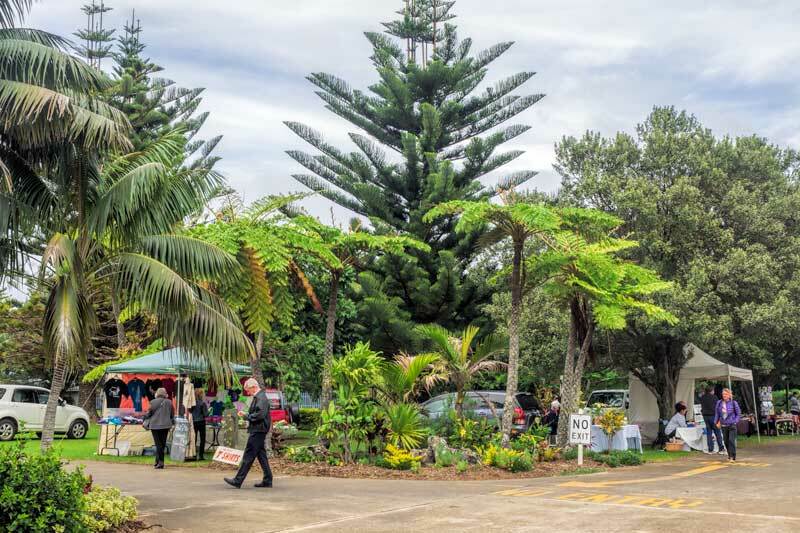 On Sunday there’s a general market on the other side of the Information centre and there’s often local produce to be found here too, on the day we visited large quantities of beautiful looking avocados, cherry guava and a few other options were available. 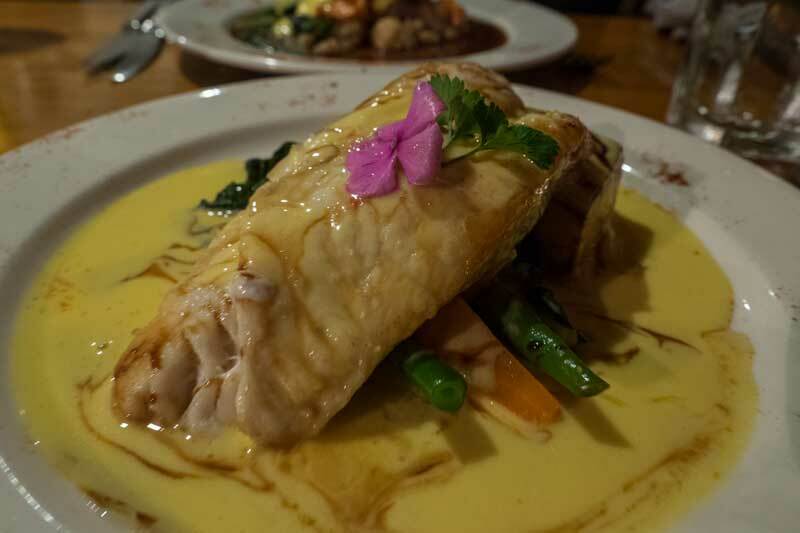 You may not have planned your visit to Norfolk Island as a foodies getaway but there are plenty of good reasons to come away singing the praises of the local chefs, restaurateurs and boutique producers. Oh my goodness, looks like a foodie’s hidden paradise! I’ve just finished breakfast and I’m already hungry again. Now I have another reason to add Norfolk Island to my bucket list. The food side was a total surprise to us. It’s difficult for a small island when they’re reliant on food being flown or shipped in but I guess they have a history of self sufficiency and have created a thriving locavore movement. The fish would be lovely and fresh. I’d love to try both of the fish dishes you had. Sounds like a lovely break with all the eating out you did!